I got up early on Monday morning thinking that there might be an inversion happening since it occurred on Sunday as well. 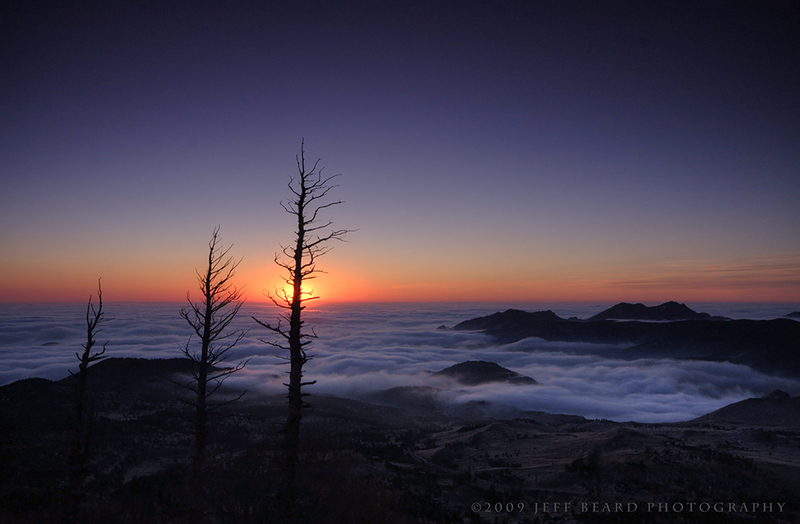 An inversion is when a layer of air pushing another down on the ground. Historically, in the Denver Basin, this has meant poor air quality. And while that may have been the case, the scene above the clouds is completely different. I’ve been hoping that I get to see this weather event and even more so to photograph it. I think it’s a particularly unique and beautiful situation and some of my favorite photographs have been of this. Having had the intuition that the fog in Boulder might have been part of an inversion, I got up early and headed out with extra strong coffee in hand. I decided that since I may be wrong about the inversion that somewhere close by would be best so I chose to drive up to Sugarloaf Mountain. You can hike to the top and there are some pretty spectacular views of the whole Front Range as well as The Plains. I knew I had made the right decision when, after driving for 20 minutes in fog, I broke through the clouds and saw stars in a clear sky. That was a good moment. I parked, put on my pack and hustled up to the summit. I sat down for a few to minutes to catch my breath and contemplate the beauty of what I was seeing. The fog below was actually receding, the wind was blowing and it looked like a roiling sea of clouds, always in motion. Although there were some large, yellow glowing areas where the local towns were, the clouds blocked a lot of light pollution so the sky and all it’s stars were clear and bright. These are the moments that keep me walking into the mountains year after year. They are a profound gift which is also why I like to share them. After a while, I stumbled around in the dark to find some reasonable compositions then setup my camera and started shooting. I moved around to play with the burned, dead trees and some other foreground subjects. I even shot some images of the back range too (I’ll have to head back up now that I have a feel for the location). But the call to parenting duty got stronger so I packed it in at 8 a.m. and headed back to town.